Capetonians and visitors alike opened the festive season in glamorous champagne style at the Moët & Chandon Golden Tree Lighting Ceremony on Thursday 29 November at SILO 7 at the V&A Waterfront. The SILO District came to life as a crowd of more than two thousand gathered to experience the lighting of Cape Town’s grand Moët & Chandon Golden Tree, created entirely from champagne bottles. 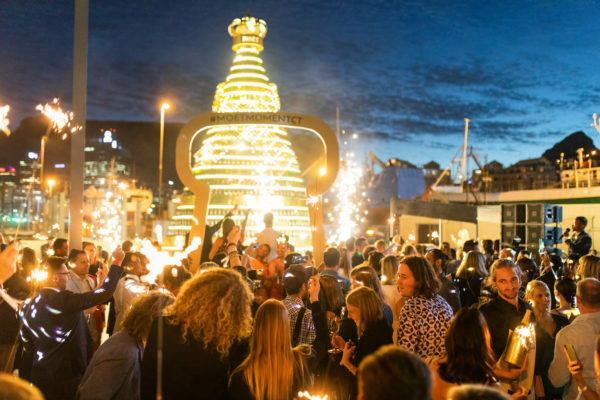 With Table Mountain’s iconic silhouette framing the Moët & Chandon Golden Tree, merry-makers and late-night shoppers came together in celebration on a perfect balmy Cape Town evening. MC Maps Maponyane opened the night’s festivities with the reminder that the Tree’s 2000 bottles represented 2000 special #moetmoments enjoyed by champagne fans from all over South Africa. Excitement filled the air as members of the SA Youth Choir set the festive mood with a repertoire of choral music and carols which elicited an emotional response from the audience. A polished performance by the Cape Town City ballet to Tchaikovsky’s ‘The Nutcracker’ followed as sparklers were lit in anticipation of the tree lighting ceremony. 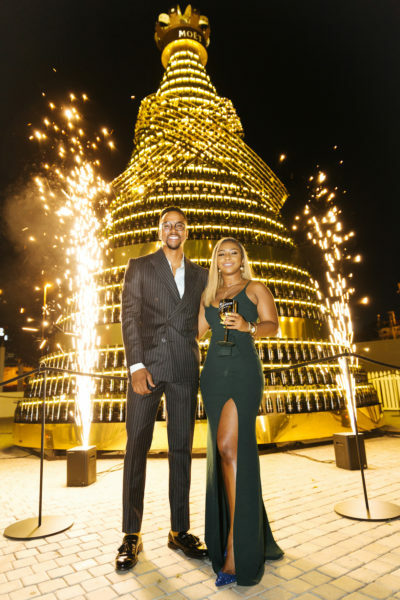 SA’s very own golden girl, Boitumelo Thulo (aka ‘Boity’), was given the honour of lighting the impressive four-storey high Moët & Chandon Golden Champagne Tree. An impressive lighting display ensued, with 230 metres of LED lights individually programmed to illuminate in sync with themed festive music and giant sparklers. Crowds cheered and watched in awe – Cape Town really had given the Times Square tree lighting ceremony a run for its money. The Moët Golden Tree will be situated in the Silo District until Sunday 6 January, wrapped in a shimmering gold ribbon created with over 2000 discs. This year Moët & Chandon have also created the ‘Moët Music Box’ which allows visitors the opportunity to personally interact with the Moët & Chandon Golden Tree – by simply turning the music box lever they’ll activate a magical 40-second lighting show, bringing the tree to life. So gather friends and family and make your way down to the Silo district to visit the Moët & Chandon Golden Tree and ring in the festive season in style!